If you want to see the two absolute opposite ends of the decency spectrum, look no further. On one end, we have the victim, a 17 year old girl who was headed to a job interview at the local mall. On the other end, we have a gang of girls who “punched her, kicked her, and stomped on her head,” according to the victim’s mother. 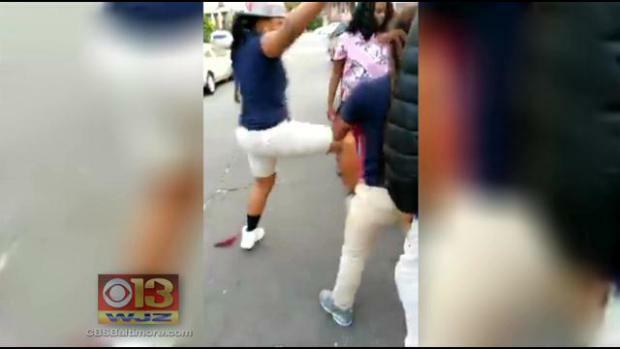 A 17-year-old is beaten and robbed by a girl gang in West Baltimore. The entire thing was caught on cell phone camera and shared repeatedly on the web. Now the victim’s mother speaks with WJZ. Two words come to mind while watching this video: Animalistic and disturbing. Clearly we need to not only crack down on gangs, but strengthen the family unit in black communities. When families care, and heavily discourage this type of behavior, we find that there are fewer social issues to contend with.